Orbit UK has acquired at auction two titles by Jason Arnopp, an author, script-writer and journalist who has previously written fiction for Doctor Who and Friday the 13th, comedy for Radio 4, and who has worked as a journalist for publications such as Heat, Q, The Word, Kerrang! and SFX. 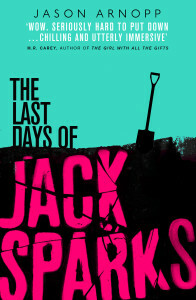 The main edition of the first book, entitled THE LAST DAYS OF JACK SPARKS (UK|ANZ) , will be released in July 2016. THE LAST DAYS OF JACK SPARKS claims to be an account of the untimely demise of Jack Sparks – a controversial journalist and social media star who died during the course of researching his new book on the occult. The majority of the book is said to be written by Jack Sparks himself – compiled from files found after his death – but it also includes interview transcripts, emails and additional material from those who came into contact with the journalist at the time of his passing. Halloween, Jack Sparks, Jason Arnopp, Social Media, The Last Days of Jack Sparks, thriller, Who is Jack Sparks?